It’s Monday, my friends, and today we’re going to talk about doorstops. If you’re like me, you live in an older building and while they do have tons of character, they may also have one other thing; uneven rooms. Most of the doors in my apartment don’t stay open when I want them to. What’s a girl to do? Well, a girl can go to any home improvement supply store and pick up a few concrete patio stones. You can use regular bricks as well, but I like the patio stones for the shape. 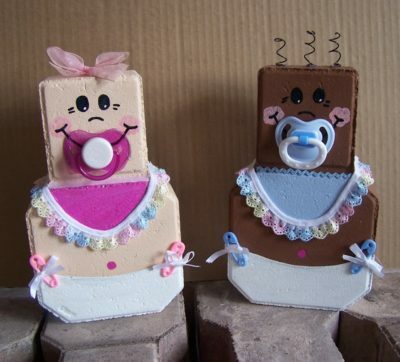 Having the wider bottom lends to creating some fun and interesting little characters to hold open your doors for you. However, I feel obligated to point out to you that you can paint regular bricks to look like books, which is also super fun decor (at least if you are a book nerd like myself). 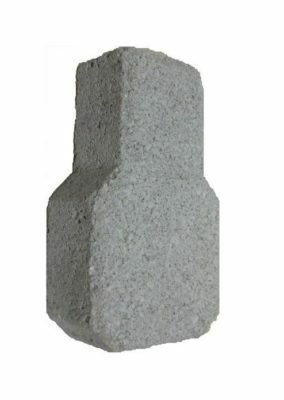 I will now stop talking like a Faceless Man and move on to describing all the fun things you might want to do with your concrete patio stones. Since they are so easy to make and don’t cost a fortune, you can potentially make one for every holiday! Below are examples of Easter, Christmas, and Halloween. But you don’t just have to stick with holidays. Maybe you really really REALLY like chickens? Or dogs? 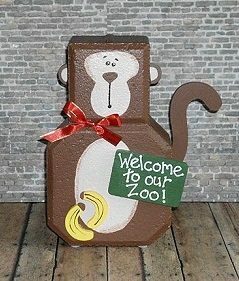 Maybe you want something special for the door to your new baby’s nursery. Perhaps you live on a farm, or run a dog shelter, or a daycare? These three examples would work great! 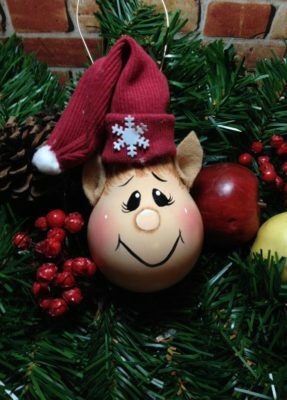 To make these adorable decorations, start by washing your concrete patio stone with soap and water, then let it dry completely. This removes any dirt or dust that may prevent the paint from sticking to the stone. Once the stone is dry, paint on a layer of the sealer so that your paints don’t “soak” into the stone’s pores. Next, you’ll add your first coat of paint. Since the sealer isn’t going to block off those pores completely, this is why you may need multiple coats of paint for a nice, smooth finish. You don’t have to paint both sides of the stone but you can if you want to. For your pattern, you can either use graphite paper to transfer a traced pattern onto your stone (you can even purchase patterns from sites like The Winfield Collection) or you can free-hand your own pattern onto the painted stone with a pencil (use light strokes!). 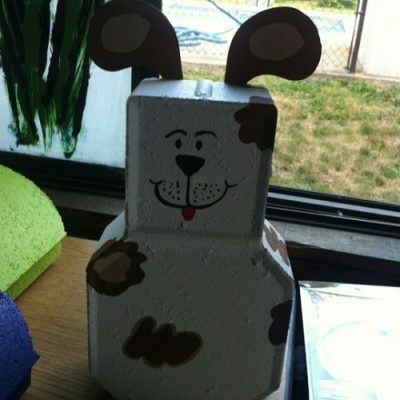 Use your pattern to paint on the details for your doorstop. Faces, spots, hands and feet…whatever your pattern calls for that you don’t think you’ll use other mediums to depict. Example of other mediums; wooden cut-outs of hands and feet that can be affixed to the stone and give it more of a three-dimensional feel. Once all of that is dry, put another coat of your sealer on to protect the design. If you are using other mediums (such as those cut-outs or the googly eyes or pacifiers), use your hot glue gun to attach these items once the sealer is completely dry. And that, as they say, is that! It’s just another Manic Monday, fellow crafters! The last one before Christmas Day! So I thought I would focus on the holiday that is quickly approaching. If you celebrate Christmas, you no doubt have had at some point in your life, a Christmas tree. And you probably were really excited to decorate it too, right? Except ornaments (like so much else during this holiday nowadays) can end up costing you quite a bit of moola. And that’s money you could be spending on presents for your loved ones. But you don’t have to sacrifice your decor just so you can put presents under that tree. If you have old burned out light bulbs, you can decorate with your own personal flair. Heck, you can do what store bought ornaments don’t always allow and customize your tree to whatever your holiday heart desires. All you need to accomplish this goal are those burnt out light bulbs (and don’t limit yourself to regular sized incandescent light bulbs! You can also use candle, flame, candelabra or even classic Edison style bulbs). You will also need a selection of different sized paint brushes, acrylic paints in the colors you plan to use, and some ribbon and a hot glue gun. I personally also like to keep some colored felt, puff balls, and scraps of old fabric to use, should I be so inspired. If you don’t feel particularly good at coming up with ideas on your own, here are a few you can try. 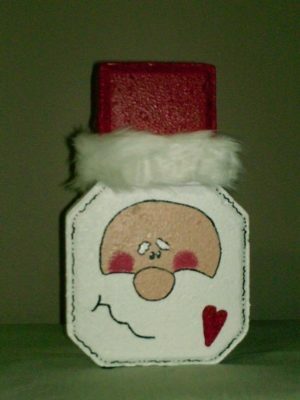 Christmas ornaments don’t just have to be Christmas-related, you can also do winter themed ideas. So in addition to Santas, Rudolphs, and elves, you can also make snowman and penguins! Really, you can make whatever you want to decorate your tree with. 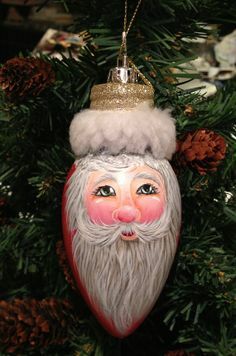 Maybe you want to go with a ballet theme to your decorations this year…paint a Nutcracker’s head. My mom’s house always has references to a Winter Wonderland…this would be a great theme to incorporate snowman and penguins and maybe even a narwhal into. The penguin would probably be the quickest and easiest to paint. 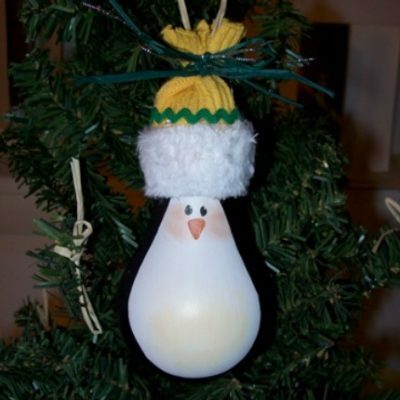 An upside down light bulb already resembles a penguin, you really just have to color it in. Go as simple or as exquisite as you want. You can make a simple cartoon penguin or a regal Emperor penguin (if you are a slightly more talented painter than I, that is. I’ll stick to the cartoon-y one). And you don’t have to add anything to the top to hide the metal portion, you could just paint it black. But I personally like the idea of giving your chill little friend something neat like a hat. For you Santas and your snowmen, you have a couple different options. Stick with either the head only (easier to paint in the long run in most cases) or make the full body too! Again, adding little touches like a flannel fabric to Santa’s body (Santa Jammies!) 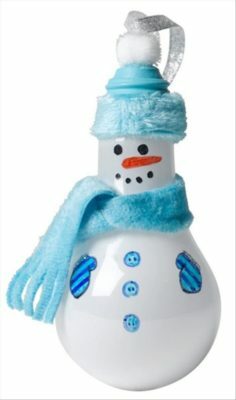 or a tiny yarn scarf around your snowman’s neck can give your ornaments that something special, a little personal flair. 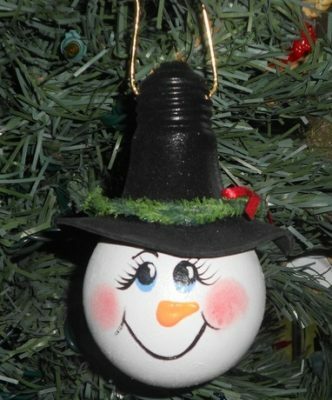 While I personally love this idea for decorating your tree each December, decorative bulb ornaments don’t stop at Christmas. You can make dreidels as well for Hannukah. 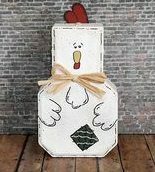 You can make turkeys and scarecrows for Thanksgiving, witches and jack-o-lanterns for Halloween and bunnies for Easter. And you don’t have to hang these from a tree either. 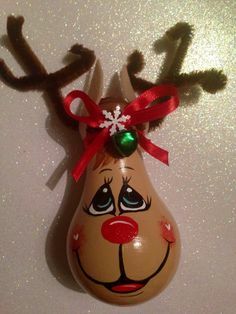 You can hang them in doorways (just warn your taller guests of the potential hazards), dangle from the front of your mantelpiece or even hang in your windows. 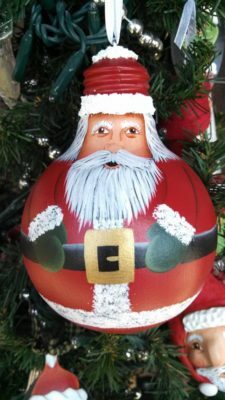 This is not only a great way to decorate with your own style and flair, it is also an inexpensive and relaxing way to holiday up your home. Enjoy sitting down with a few old light bulbs, some paints and your imagination and see where the day will take you. Since I can taste tannins, I’m not a big coffee. To even enjoy tea I have to add sugar and milk to it. Which is why I think I covet all my tea mugs so fiercely. I hardly get to use them so when I do they need to be something unique. Figuring I wouldn’t be alone in my mug pursuit I wanted to share my latest cup discovery. I’m not sure about where you’re living, but where I’m living, a spectacularly hot few days have finally ended and we are into weather that is more appropriate for fall. 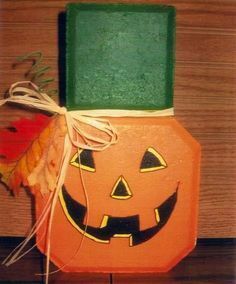 This gets me thinking about jackets, hats, scarves and of course, Halloween. 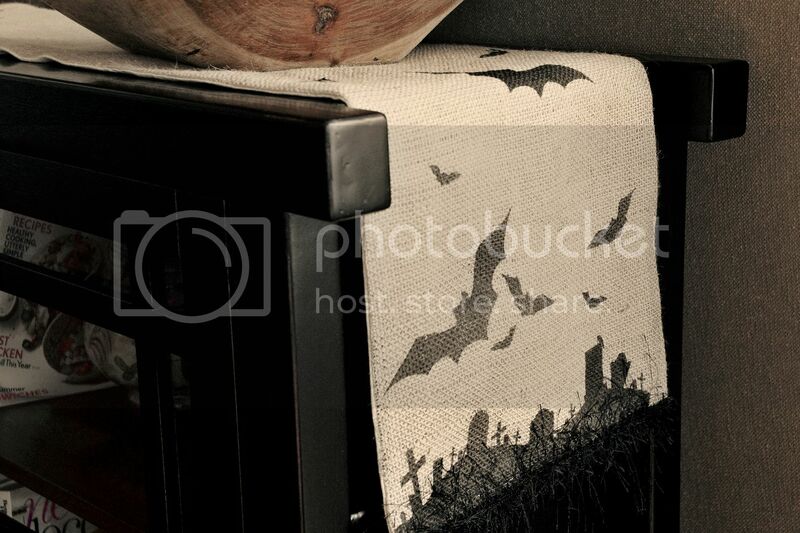 There’s something beautiful about Halloween decor that is not only season appropriate but also a beautiful addition to the home. It tickles something inside me and reminds me of my youth. I have a tutorial today for you to make a table runner which is highly customizable and looks so cool when it’s done. You can find the full tutorial here, but I’ll be giving you the rundown. You will need a few supplies. Burlap, being one, and some form of cheap fabric to line the runner with – it can be unbleached cotton or muslin, but check out your remnants bin at your local craft store and see what’s there. You can either buy a section long enough for your runner, or you can sew a couple sections together if you’d like to be a little more economical. 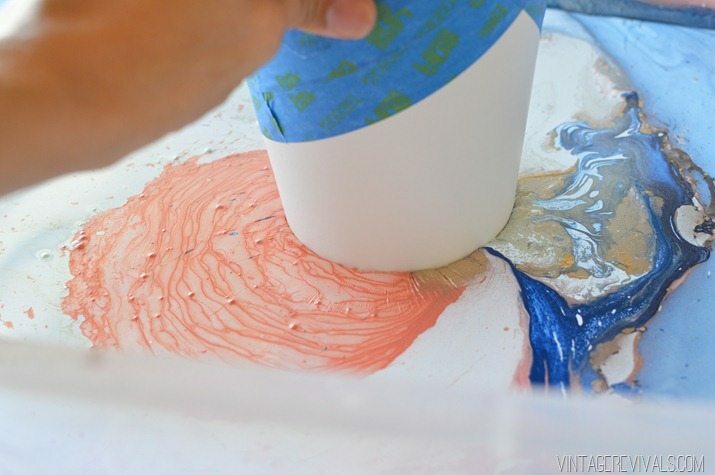 You’ll also need freezer paper, spray paint, some kind of cutter or exacto knife. I would say that instead of spray paint, you could also use some stenciling brushes and paint if you’re got some already at home, or there are colours you want to use. Just keep in mind washability. Since this is a seasonal item, I usually don’t worry too much about it, but you might want to get some fabric paint that you’ll be able to wash afterwards. Your first step is to decide how long you’d like to make your runner. Make it long enough so it can hang nicely over the edges of your table. This tutorial had a finished size of 11″x88″, but it isn’t necessary for it to be that long. 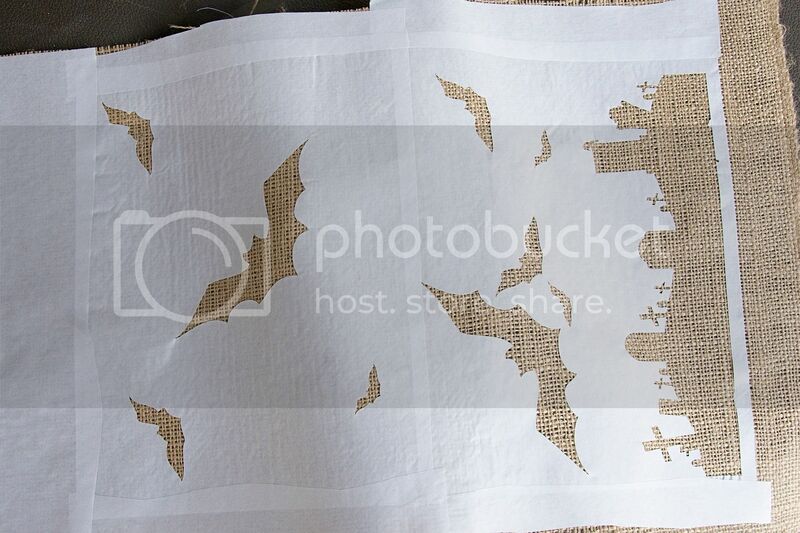 Next, cut your burlap wider than you’d like the actual runner to be. 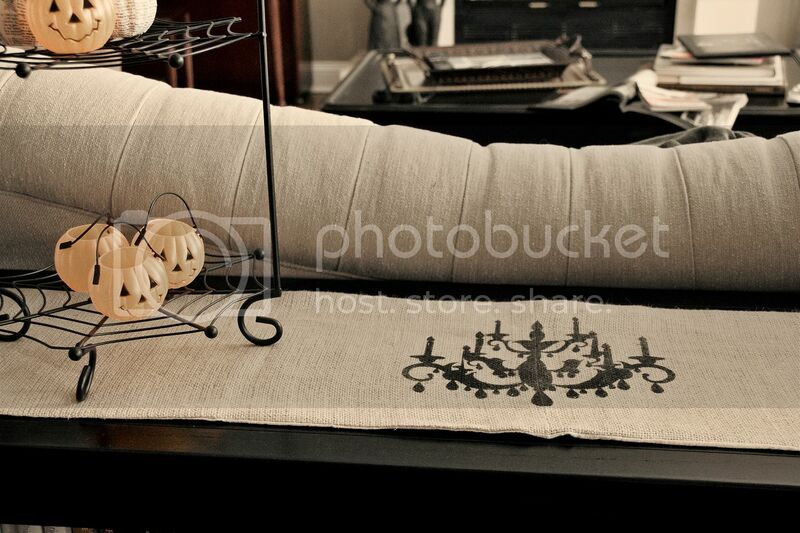 Burlap can fray very easily, so leave an inch and a quarter on each long side of your runner. You will want to cut your lining material 1 inch wider than your finished runner. Next, with the waxy side of your freezer paper facing down, cut out the design. You can either hand draw your design, or you can print it out on regular paper and use that as your negative design – just make sure that you attach the freezer paper to it so that your burlap is fully covered. Use the knife to cut out your design, and just be careful to have nice clean edges. To help you get cleaner edges, you can iron your freezer paper to the burlap with the wax side down so it will stick and give you some nice sharp edges. 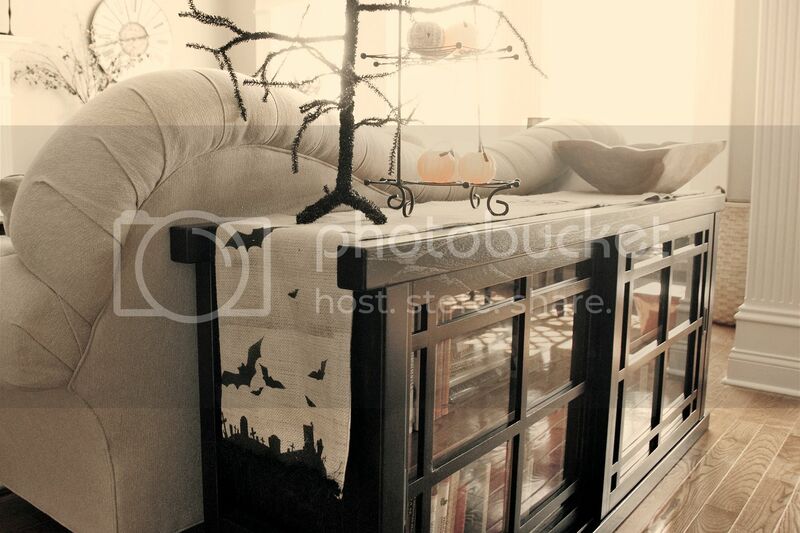 You can put designs anywhere you want, whether it`s just at the edges or along the centre as well. Just make sure that you cover any space you don`t want painted as if you’re using spray paint, you can have quite a wide spray radius. 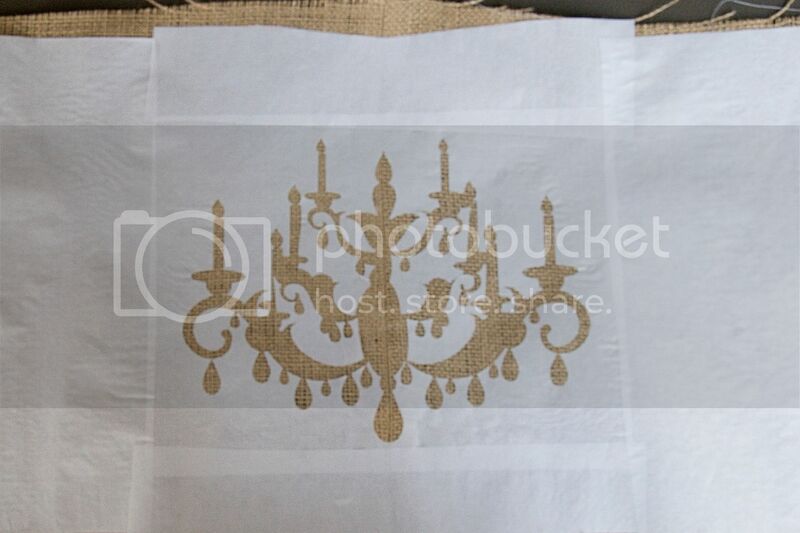 Next, spray over the designs onto the burlap, or use your stencil brush and paint to fill in the negative space. Make sure your paint is even and when everything is dry, you can remove the paper. You can now place the runner and the lining together, with right sides together and pin. 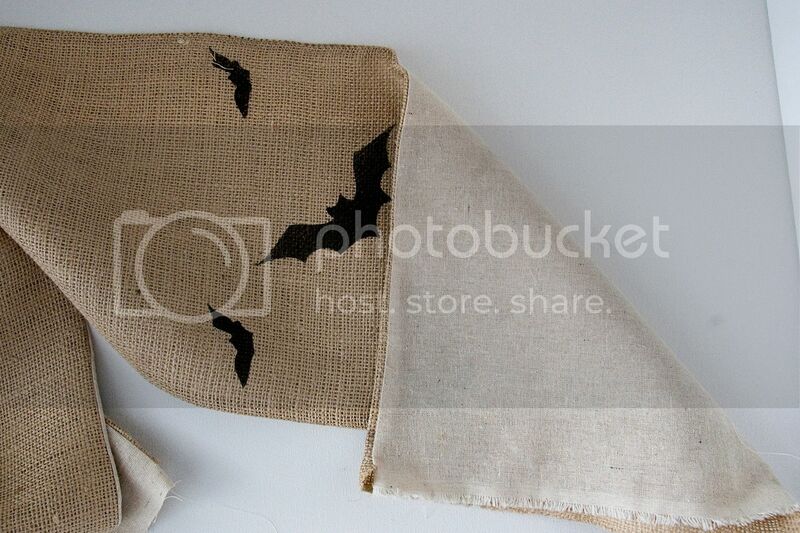 The burlap is bigger than the lining, and that’s okay, remember, we wanted to account for any fraying. Stitch a half inch seam down both sides, leaving the end open. 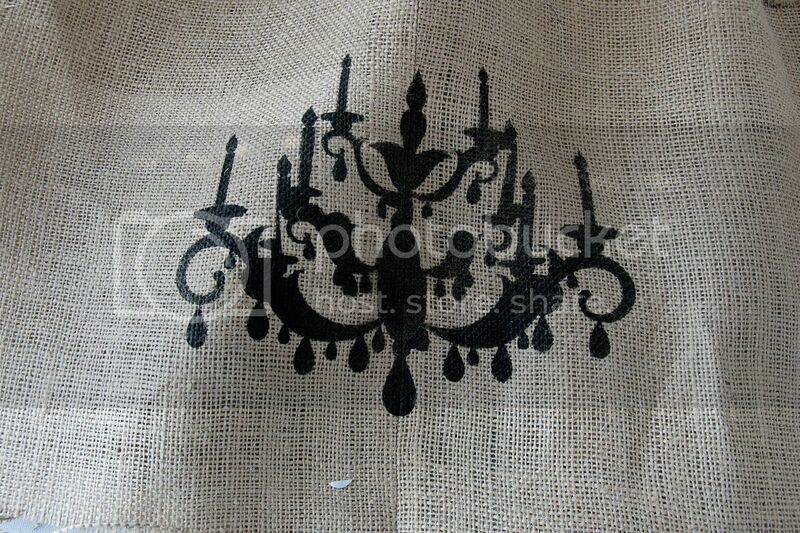 Trim off any excess burlap so that your seam allowances are even. Turn the runner right side out and iron, design side down. Please put an old towel underneath your design so you don’t get any paint to stick in places you don’t want it to. Fold the ends of the runner so that the raw edges are tucked in, and if you want to put some trim on the edge of your runner, cut a piece to fit and pin, then top stitch all the layers together – do this for both sides. That’s all you need to make this beauty! I love that it works for us creative types that can’t actually draw, and so that makes me a happy lady. Hope you enjoyed the DIY, and happy crafting! The best part is that you can walk into any dollar store or craft store and find something you can dip. These can make amazing gifts for birthdays, bridal showers, or even just to give your home a little colour. Just remember that with this particular technique, you’re using spray paint, and so you will want to make sure this all stays on the outside of whatever project you’re doing. I wouldn’t say this is food safe. So, your first step is to get spray paints of the colurs you would like to marble. RustOleum is recommended if you’re looking for metallics, but the rest is up to you! You will also need a container deep enough for whatever you want to dip. So a bucket or a tote would work very well. 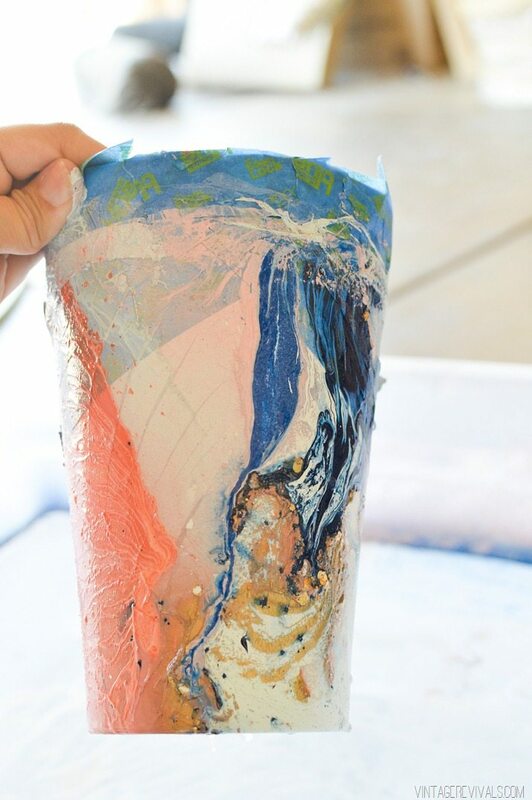 You might also want to test your dips before actually working on your piece, so some paper cups would come in handy. 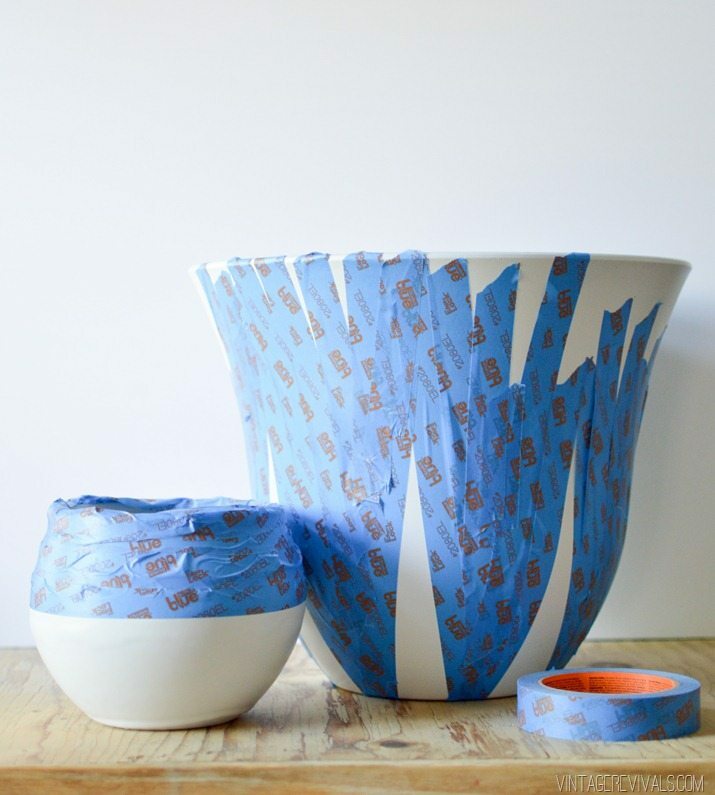 You’ll also need some painters tape, if you’re wanting to have some sharp edges. And that will be your first step (see above), to tape off any areas you do not want dipped, or not, as you prefer. 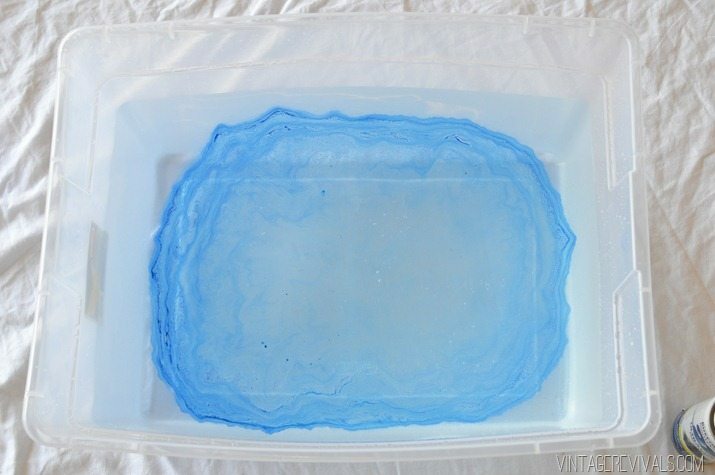 Start to add your spray paint to the water filled tub. You will need to do this quickly, so read everything first and then start. Make sure to hold your spray can about 10 inches from the water, so you don’t get bubbles that will show up on your finished piece. Add as many colours as you’d like, and spray them in in different places. 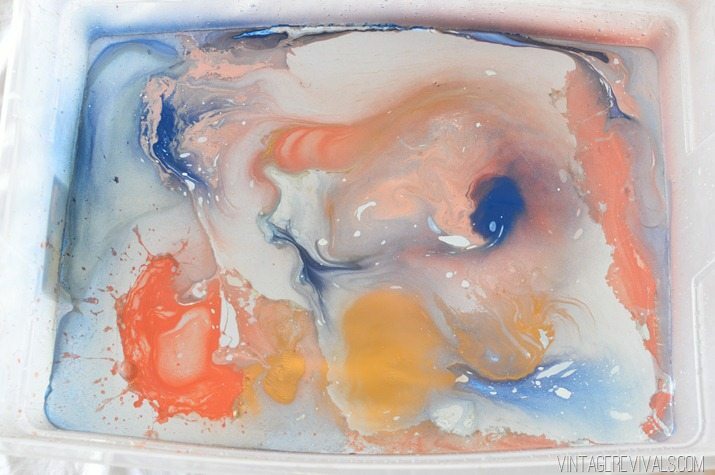 When you’ve added all of your colours, give your bucket a very gentle couple of taps on the side to make waves (not bubbles) to swirl the paint around. Slowly dip your project into the water. If you go too fast or if your paint is too dry (see my comment about working fast above), the paint surface will break and you will have gaps with uneven edges. 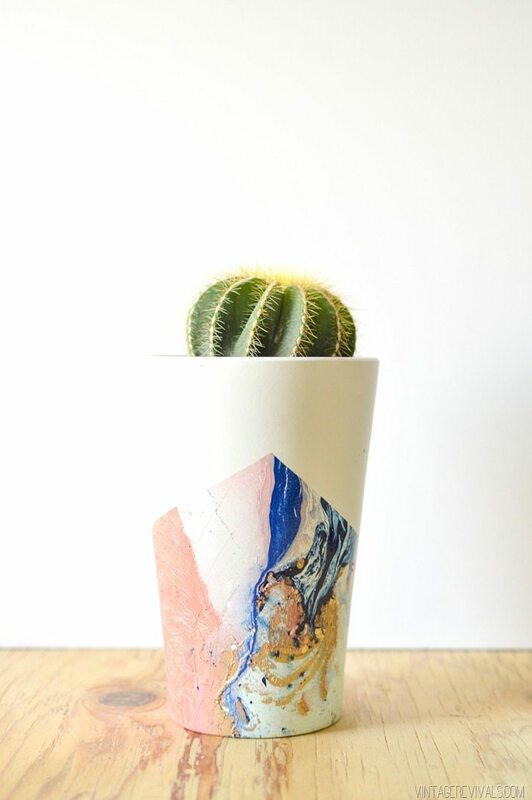 Dip the planter into the water as far as you’d like and hold it there for about 30 seconds while you lightly fan the paint surface to quicken drying. If you used painters tape, it will make it so that any wiggling that would put more paint on in that area, will be removable. 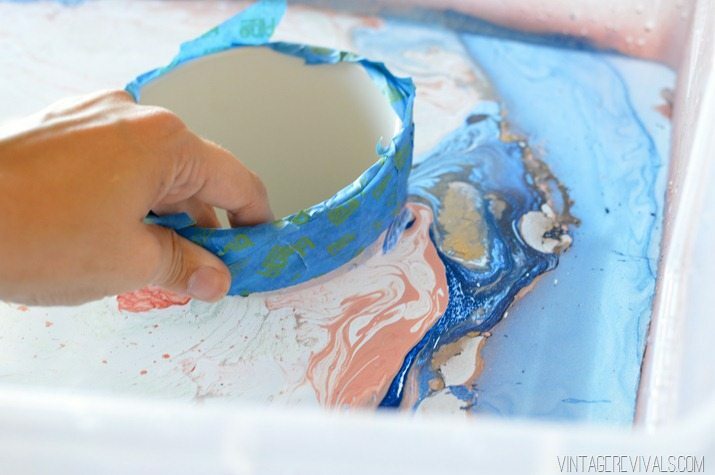 Use a spoon to wipe away all the remaining paint floating on the surface of the water (you might want to use a plastic spoon for that). This will allow your project to come out with a clean design. Let everything dry completely before you remove your painter’s tape. And voila! You’re done. You might want to give a spray with a sealant if you’re planning on using these outside, so that inclement weather doesn’t have any ill effects on your work of art. Hope you enjoyed the tutorial! I have for you a DIY for he men in your life. Whether it’s a birthday or a groomsmen gift, finding hand made gifts that work for men can be a challenge. What I love about this tutorial, as the original writer states (who is a gentleman), is that it’s gender neutral. So you can customize it for whomever you’d like to give it to, but that makes it perfect for a gift for a gentleman. This is a tutorial for a hand printed mouse pad (you can find the original here). Perfect for gamers, tech lovers, and people who work at a computer. You’ll need some supplies for this. You’ll of course need an 8″ round, blank mouse pad. For your own ease of work, I would probably choose ones that don’t have the wrist rests, and I would probably choose white, so you can do whatever other colour you would like, and it will show up easily. You will also need 8.5 x 11 full sheet labels, a computer and printer, a craft knife/box cutter and cutting surface, a textile acrylic paint and stencil brush (which is available at craft stores, and iron and wax paper. Your first step is to choose your design from a template that you can find online (check out this website here) or you can design your own if you’re artsy that way, and print it onto the label paper. Secoondly, you’ll need to choose your colour palate, and a lighter colour for the background is recommended, and a darker one for the foreground image. You will need to use the stencil brush to apply a base layer of colour. 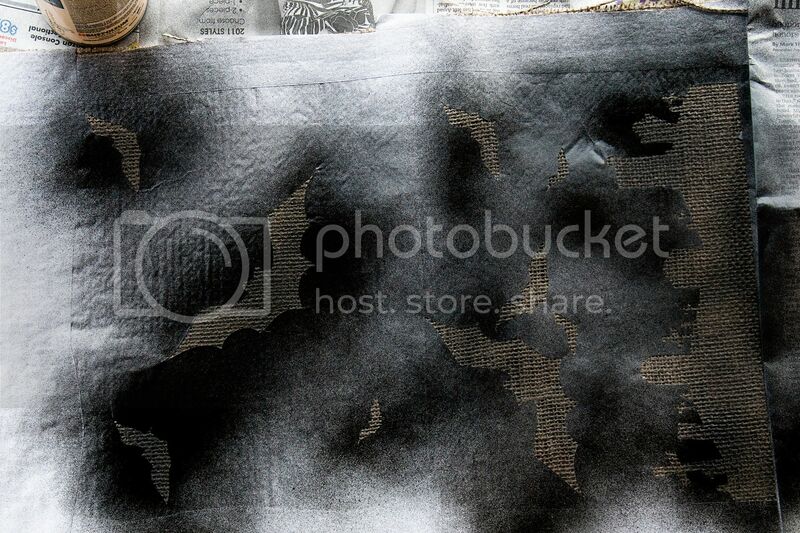 While this coat dries, you can use this time to cut out the grey images of your template. Make sure to keep the white images that you cut out though, as they will be the resist for the top layer of colour. Peel the backing layer off the largest piece, and carefully adhere it to where you would like it to be on the mousepad. Using the template to refer back to, place the other pieces on the mousepad so that you have a replica of the original image on the mousepad. Mix your top colour to your satisfaction and using a stencil brush, use quick dabs to apply the paint. Wish stencilling, you don’t want to have massive quantities of paint on your brush. It’s better to go with less to get the sharper lines. Remember, you can always go over the design a second time to make sure the area is covered. 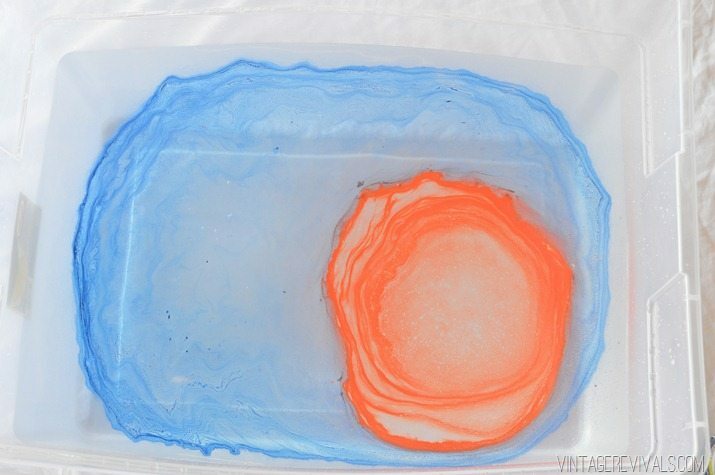 When the paint is dry, cover the mouse pad with two layers of wax paper and iron on medium high heat (or follow the package directions) to set the ink. And that’s it! Now, keep in mind that if you’re wanting to add other colours, that you can do that in any of the negative spaces. You’re not limited to one colour. Hope you enjoyed this cool tutorial. Happy crafting! 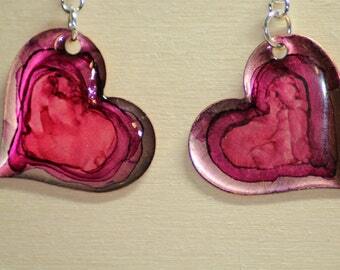 I come to you today with a relatively new local (to GTA) designer who does one of a kind, hand painted jewelry. I met her at a local craft fair that featured lots of local, Canadian talent.It was lovely to see this small, local show filled with vendors of a very high caliber and selling a wide variety of things that were both unique, handmade, reclaimed, or a combination thereof. It’s here that I met Sue. 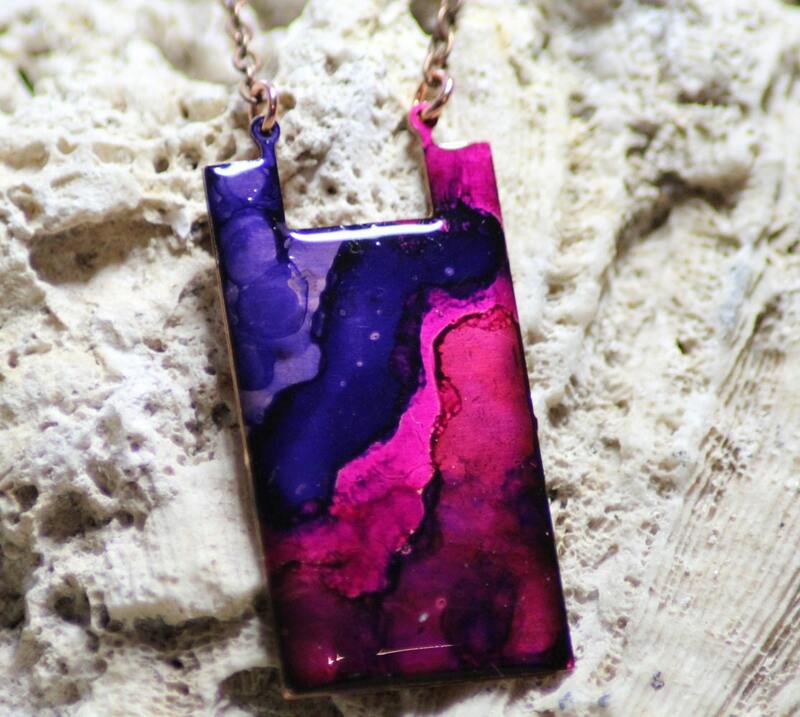 She makes some of the most amazing hand painted jewelry, and every piece is unique since the combinations of colours and how the paints work together will be different each time. She paints on a few different metals, but one of the main metals that she works with is copper, though she will also have some pieces out of titanium, Sue makes earrings, necklaces, and bracelets, and though they are not matched as a set, you can definitely match what is available to have a set. I think what really caught my eye about her creations was not just that they were extremely reasonably priced, but that the colours were so vibrant. When you see these pieces in the light, especially out in the sunlight, the paint that she uses to create these lovely works of art really does come to life and becomes just radiant. She also coats the top with a resin not only to preserve the paint but it somehow just makes these colours look so metallic and bright. I also don’t feel like I’m going to accidentally scratch some of it off in my day to day wear – I am not a graceful person at the best of times, and after a few wears, it’s still as good as new. I highly recommend checking her out and seeing what she has on hand. You can find her shop here, as well as lots of photos on her Facebook page and Twitter. I’ve worn my pieces from her multiple times already and had quite a few compliments, and I can’t wait to start seeing Sue at other shows through the year. Follow her page to see where she’ll be next! Happy Happy Joy Joy & Polish Co. I was at the Craftadian craft fair in Hamilton, Ontario, where local artisans get together to sell their wares and I had a great time and I met a whole bunch of new people. I will be doing a series on the artisans that I met there who made some amazing hand made things. On that note, I would like to introduce Joy & Polish Co. who is a handmade nail polish company. That’s right. Hand made nail polish. Check out our Spring Collection, available at Craftadian Spring Market this Saturday and on Etsy. Looks like someone figured out iMovie. When I met this company at the show, it was an unassuming little table with a really simple set up, and what caught my eye was my feminine inclination for pretty, sparkly cosmetics. These nail polishes are free of the “big 5”, which, if you’re not aware, are: dibutyl phthalate, toluene, formaldehyde, formaldehyde resin and camphor. Formaldehyde is what is used to preserve bodies, so, I don’t know about you, but I don’t want that anywhere near my live body. The colours are fantastic, as you can see, and they wear well. I did 3 coats on my own nails (yes, I bought some), and even without a topcoat or bottom coat, lasted for 3 days without chipping. And I work with my hands. These guys sell on Etsy, and you can check out all their stuff here, on Facebook too. Their prices are not more than what you’d find in a drugstore and they do shipping (and pickup if you’re in the area). Hope you enjoyed this post, and check them out. Their colours are just phenomenal!!! Hey there, fellow Hackers! Tis Scribe Sarah again, here to tell you all about yet another Etsy shop that you should all definitely check out. This shop is especially great for any coffee or tea aficionados. The shop owner is the lovely Ashley Marie and it’s called HandPaintedNerd. I was attending Wizard World Chicago last summer and one of my favorite things to do, especially at the large conventions, is to browse through all of Artist Alley. I was thrilled to come across many booths that looked interesting but, at one point, my eye drifted to a coffee mug, painted all green and with beautiful Middle-Earthian-type font on the front, it said “What about second breakfast?” My geeky little heart soared with joy at seeing this. There are two things I love more than, like, everything on the planet; Coffee and Lord of the Rings. I, of course, stopped at the booth to check the price on the mug and saw a bevy of Harry Potter-inspired mugs as well. There were tall mugs, regular sized, even travel mugs! All are hand painted ceramic and gorgeous. Ashley have an incredible talent. She and her booth assistant directed me around the corner to the other side of the table, where I found about 7 different Firefly-themed mugs. I was stuck. I was sold, the only problem I had now was that, at the time, I could only afford one and I didn’t know which one I wanted most. I landed on this one. Because, let’s face it, Mal Reynolds is an inspiring dude and this was one of my favorite quotes of his (I love them all, the man is my hero). Also, the gun was just so well done, I couldn’t believe it had actually been hand-painted. I took one of Ashley’s cards and then followed her Instagram. 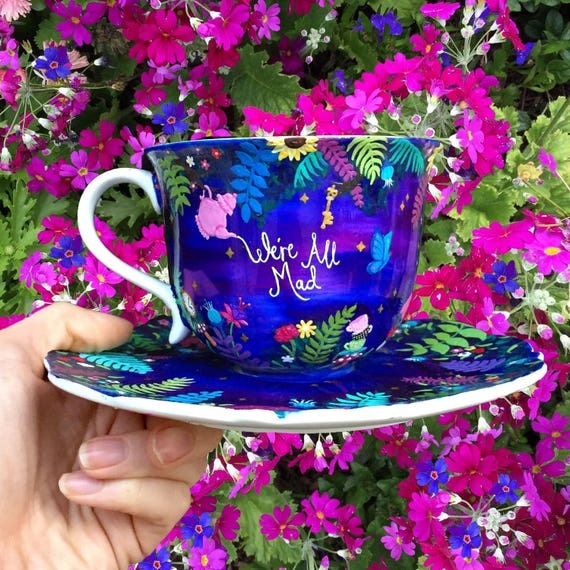 Then I favorited her Etsy shop and I constantly look at the feeds and think about getting another mug but opt out because I literally cannot decide which one to get next. Until recently, that is. Ashley had added a new mug to her Instagram and I almost immediately went to purchase it because I have been a ginormous fan of Buffy the Vampire Slayer since the movie came out in 1992. But I always had identified most with Willow. When Ashley posted a photo of her new design, I knew I had to have it. And have it I now do. See? ISN’T IT SO PRETTY!? I cannot recommend this shop enough. In addition to mugs, there are also jewelry plates, necklaces, even yarn bowls and the fandoms that are covered include Harry Potter, Firefly/Serenity, Doctor Who, Game of Thrones, Star Trek, Arrow, Lord of the Rings, Supernatural, Marvel, Gilmore Girls, Stranger Things, Sherlock…the list goes on and on. Ashley is very up with current new fandoms as well and is constantly adding new designs to her inventory.